It was a nervous finish for our last event in the Anytime Fitness & Shaw and Partners AORS this season. 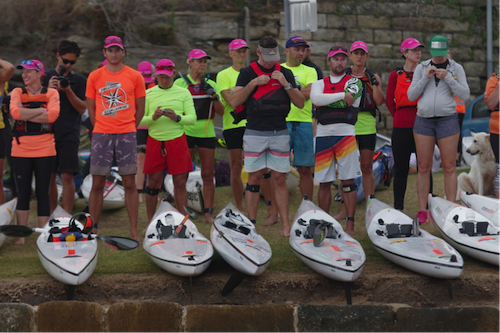 The forecast, while good for downwind paddling, didn’t bode well for the main body of paddlers that were lining up for the Manly Wharf Bridge to Beach. Tim Bailey was blurting out rain and strong southerlies for the Sunday morning which would have meant uncomfortable conditions for most in this event. As an organiser of these races, I pray constantly for great downwind conditions, exactly what Tim was telling us. For this race we want it to be calm and sunny so the competitors really get to appreciate the true beauty of Sydney Harbour. Fortunately, we dodged a bullet with only occasional showers and lighter than expected winds. 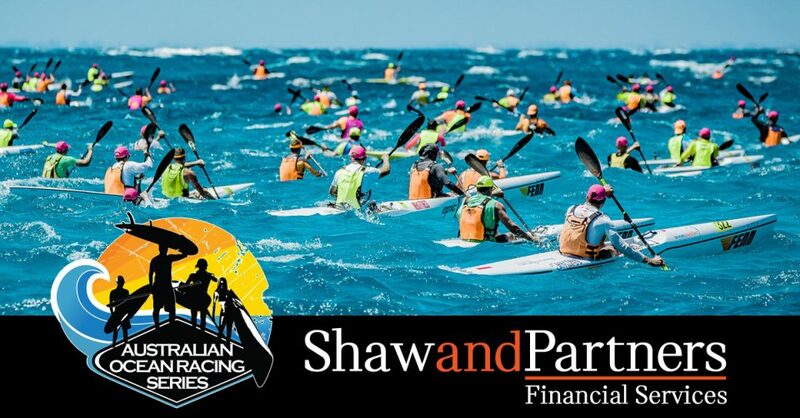 All in all this season we have been very fortunate with most events getting exactly what they were advertising and good numbers for all of the Anytime Fitness & Shaw and Partners AORS races. We are very lucky to have some truly iconic events in our lineup and are even more fortunate to work with some other passionate event organizers. The season started well up on the Gold Coast with solid downwind and a great race put together by Jamie Paul, Jezza Cotter and their team. For the first time in a long time, our series made its way to the Sunshine Coast. Jamo Porter, Grant and Marty Kenny put together a fantastic event and we look forward to that one getting bigger and better over the following years. Millsy, Sam Williams and their team in Coffs didn’t get the conditions they wanted this year but still had a great turnout and came up with a unique course that made for some great racing. Stevie Dalton and Wayne Jones continually put on a good show in Adelaide for their event. I have been there most years and they always manage to find a sneaky downwind course up or down the coast. The crew from City of Perth SLSC and the IOP Team led by Dean Beament and Rob Dougherty make the whole Doctor experience worthwhile for the travellers with some unbelievable downwind races over that late November period. We can say without a doubt one of the best downwind weeks you will ever have will be if you tie the Fenn West Coast Downwinder together with The Doctor and the Triple S races in WA. The start of The Doctor 2017 event. 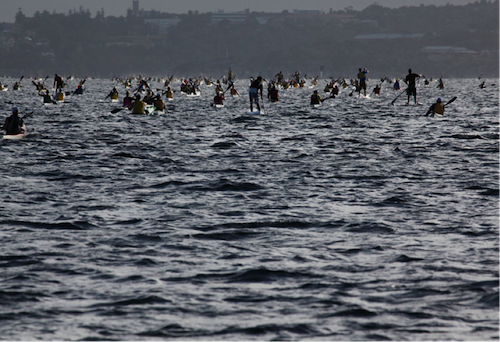 One of my favourite trips is down to the Surf Coast in Victoria for the Great Ocean Paddle. Put together by the team at Peak Adventure this event never fails to impress as you make your way along this awesome piece of coast. This season saw a bigger range of craft on the water for the events. Great to see the prone category slowly expanding and more OC1’s getting involved in the events. We believe that all the disciplines should be racing under the one banner and look forward to working with all in the coming years. 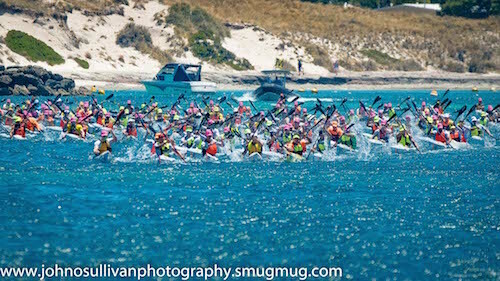 We at Oceanpaddler were very happy with the way our events went this season. 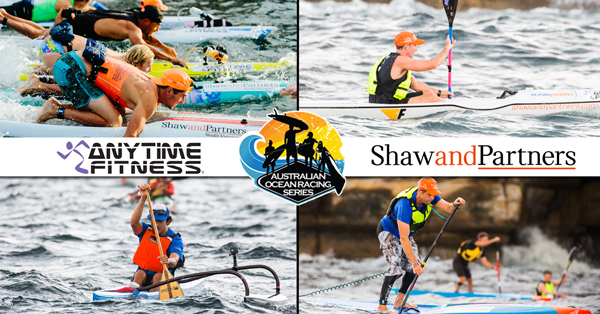 Our naming sponsors Anytime Fitness and Shaw and Partners continue to support the sport here in Australia. I think I can speak on behalf of all the ocean paddling community in thanking both for their generosity and vision. 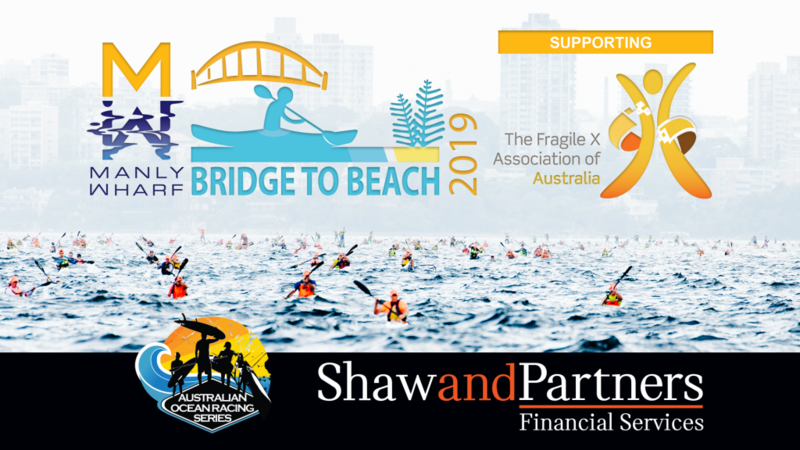 Our nominated charity, Fragile X benefits greatly from your support and Shaw and Partners CEO Earl Evans took the extra step by matching dollar for dollar your donations leading into the Manly Wharf Bridge to Beach. 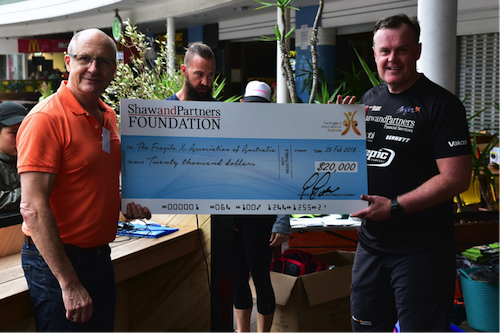 Earl Evans Handing over the cheque to Fragile X at The Bavarian on Manly Wharf. Our surf ski craft sponsors continue to dig into their pockets to support that side of oceanpaddling. Nelo, Fenn, Epic and Stellar are the reason we can continue to do this sport in this country. We invite all craft manufacturers and distributors to be involved in the sport and not just reap the rewards of the hard work done by the others. This applies to all disciplines and we hope to see more involved in the 2018/19 season. 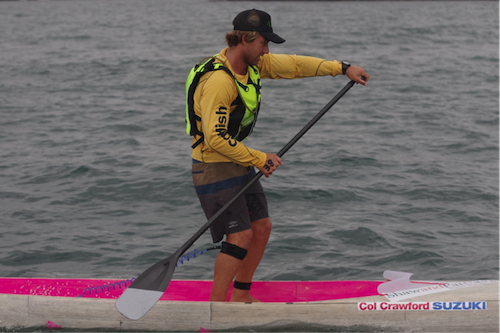 Jimmy Casey on his way to winning the Manly Wharf Bridge to Beach and the series on the SUP. Thank you to Thorzt. Every year these guys contribute to our series. This is not a new thing as they have been involved right from the start. It is great to have a sponsor like these guys and I am sure nearly all of you reading this have enjoyed a refreshing post-event rehydration from the Thorzt Tent. 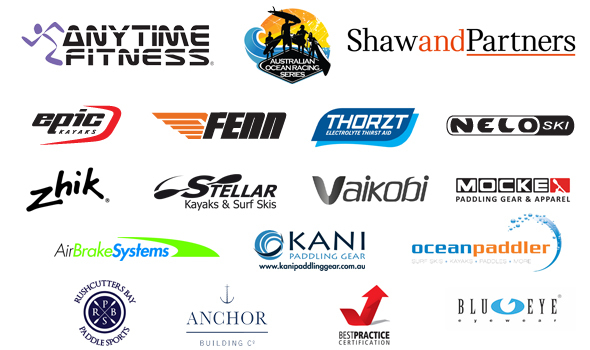 Thank you to all the amazing sponsors of the AORS 2017-2018 series – Anytime Fitness, Shaw and Partners, Thorzt, Epic, Fenn, Stellar, Nelo, Vaikobi, Zhik, Mocke, Kani, Air Brake Systems, Rushcutters Bay Paddle Sports, Anchor Building and Best Practice Certification. Next season we are changing the series slightly and more info on that will follow soon. The full results of the season can be found here. Well done to our new National Champions across the various categories. For me, it’s great to be involved in a sport where we have so many fantastic people. So many people willing to help out, The Spooners and co, our sponsors, paddlers from all disciplines really makes this sport unique. At Oceanpaddler we have an awesome team and it’s a pleasure to work with all of them. Thank you to all the participants for your support of the series.